This entry was posted in Global Warming, History, Ice Cover, Oceanography and tagged Arctic Ocean, climate, exploration, ice, oceanography, physics, Russia, weather. Bookmark the permalink. 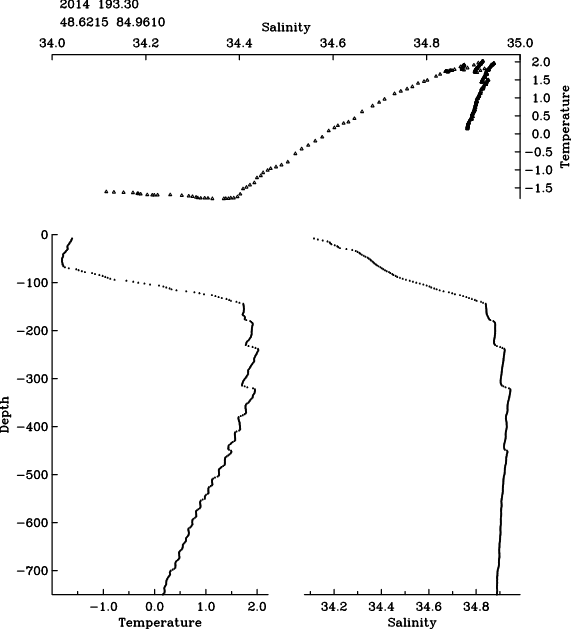 It was always my understanding that the mechanism driving the Planets ocean circulation was the freezing of the surface waters of the Arctic Ocean, where ice forms as less saline ice; driving the circulation via the resulting slightly more saline solution colder water, cooled by the creatioin of the ice above, forming a vast stream, ~200Kms wide, 200 feet deep, that runs down between Iceland and Greenland at ~1.4 metres per sec. If that is correct; at what point does the temperature invert, as that cooler water must have to drive through the warmer mid layer to reach the abyss? 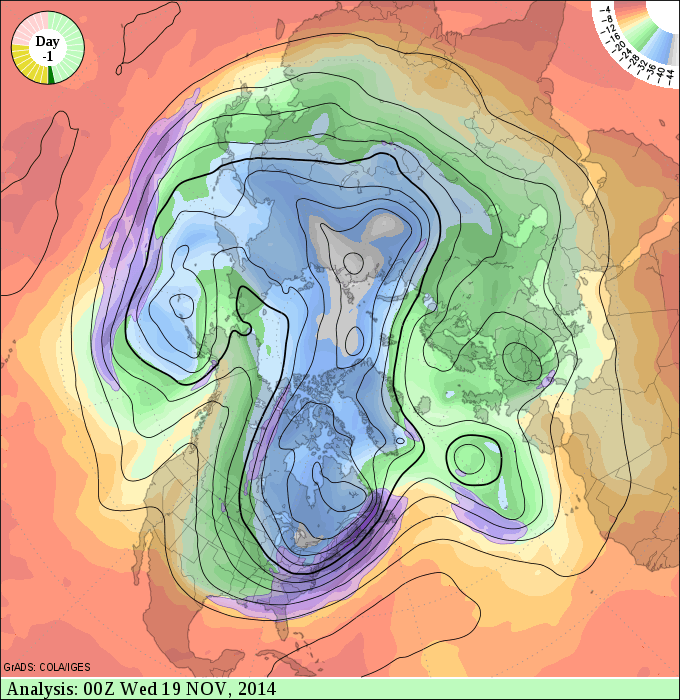 Looking at the first illustration, it would seem that the warmer water circulation is acting to squeeze the central Arctic Ocean region from each side of the region; forcing the colder air down over the US; in turn creating what seems to be a classic convergence along the US East coast. Here in the UK we seem to have been under such in earlier years, so this event, when repeated, will turn in whatever direction suits. In which case, there must be something else; not described herein; driving the rotation of the squeezed bubble around the globe. Has anyone got an handle on what that mechanism might be? Again, if the extended bubble is now to be seen as a permanent feature of the system; has anyone modeled it to see where these events take us in the future? Has anyone created a sequential image showing the movement of the feature for the last five years or so? 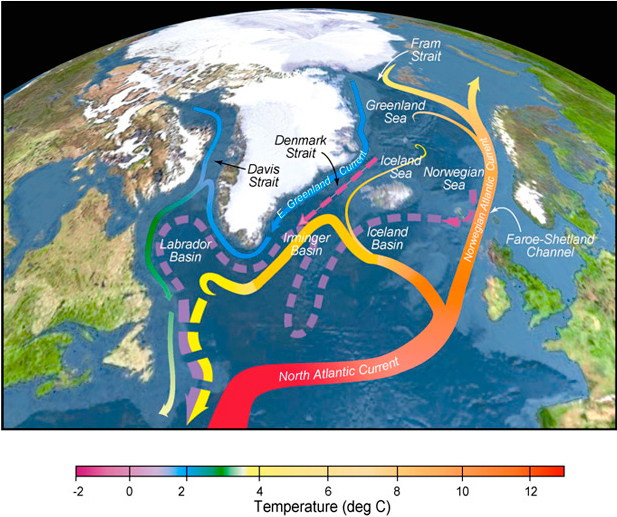 There are many drivers of the general ocean circulation. Winds, differential heating, density differences, turbulence, waves, as well as ice formation all contribute. I don’t think it is possible to come up with just one mechanism that nails it all down in one swoop. Ice formation is important, but so are the monsoon cycles and the wind-stress curl over the subtropical Pacific and Atlantic Oceans that give us the Kuroshio off Japan and Gulfstream off the USA. On both physical and philosophical levels we are all connected in ways that we do not yet fully understand. There is still much to discover which is very much part of the fun, I feel.